The summer family spent in deep in the forests of Värmland. I was after all in much better condition than before CCSVI. It was nice to regain some of the spark of life. I think it's fun to build and construct. Now I did complete some small projects that have been started but not completed. For me it has always been important to clear the brain completely other tasks. It gives new energy and new creativity. Through the years I have acquired the tools and machinery needed most of the tasks that need to be resolved. Whether it be painted, welded, salvaged, transported, towed or build, I have the tools needed. For many years I had teased me on the lawn in front of the house. 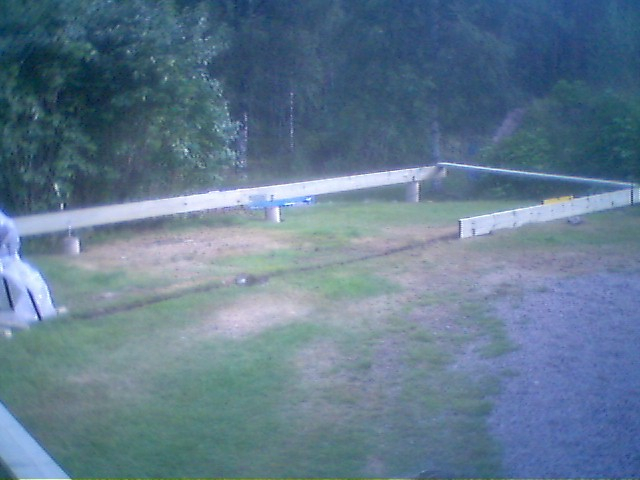 The lawn was leaning more than one meter. Long tables are tilted alarmingly. No one wanted to sit at the end of the table. Least of all the kids. They knew what would happen later in the evening. Many litres of vodka had landed on the lawn and knees over the years. After each crayfish party all guests smelled as bad as what was left in the waste bags the day after. Easter 2005, I got an idea. I'm will build a terrace. Then the problem is solved. I made a drawing on a napkin. I figured out how much lumber was needed. The order became a full truck with materials. 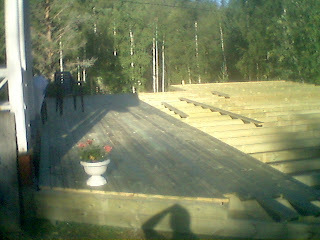 It was several thousand feet timber and 10,000 screws. The casting went for 30 sacks concrete. The only tool I was missing was a concrete mixer, it was resolved with a large whisk in the drill. 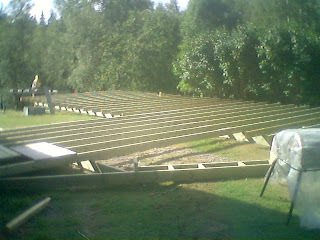 I went up to the forrest myself and started building. The result was a terrace of 160 square meters and a large conservatory. I was one week by myself and start the building. I just eat build and sleep. It was very nice to be on my own. There was quite a lot of work to build everything with loose timber from the beginning. I had to solve problems when they arise. I was obviously not ready in one week, but the foundation was laid. Later I got the help of my brother, and my son and son in-law when I mounted glass partitions and ceilings. It was probably at the last minute I did that project. Today I can not perform that type of project physically. I could sit on a chair and play supervisors, but it's not the same. It's much more fun to do it yourself. That's the whole chain, from concept to finished project that attracts me. I want to be with. My hands will work. Yesterdays dinner at Operakällaren was very good. The whole team from they buying party, me and my partner was in place. I told the waiter to inform the kitchen about my diet restrictions. The dinner was seven dishes, all of them was top of the line. The wine list composed to the dishes was excellent. Everybody laugh at my dessert. One strawberry. The old 7 seat Audi is to big now when the kids has moved from home. The car is old, it start to be expensive to maintain and service. It also use a lot of diesel. The new one is a Lexus fully loaded with batteries. Better for the nature. Me and my youngest daughter went to the airport to pick up the eldest daughter living in Munich. She is coming and visit us with her boyfriend over the weekend. The last days I had to use the crutch in the afternoon again. My schedule this week has been to compressed. I can´t keep this hi load any more. I need time to rest between different tasks. Now it is time for a glass of wi... and rest. I mean fresh press carrot juice. No I am lying, wine. Hi! That is what I call a proper terrace!! You are just amazing.